JC Penney recently got its proverbial hand slapped by Google and has been banished to the bottom of organic search result listings. The company’s website was utilizing practices that while not illegal, are considered unethical in the practice of online search methods. These unethical practices are known as “black-hat” tactics, and while they can boost organic search rankings temporarily, they can also hurt the brand and reputation. Presumably such a well-known brand would have experts on their team that would know better than to engage in these strategies and only use “white-hat” or universally accepted practices. However, the company claims they were unaware anything unethical was taking place. What is a business owner or marketer to do when presented with an opportunity to increase website rankings with a search engine by a new vendor? The promise of additional sales and visits to your site can add to your bottom line. How are you to know if the methods used by a vendor are ethical, and accepted practices, or tactics that might get your site “black listed” from the search engine results altogether? Understanding the basic principles of search engine optimization (SEO), and the types of activities that are considered unethical, should help you spot an offer that is too good to be true, before your site becomes invisible to the world. Everyone who has a website should understand the basic rules of search. These rules, dictated by Google (and other search engines), are built into a complex algorithm that determines what results are returned when a word or phrase is typed into a search tool. The algorithm is a trade secret and changes frequently, so while no one can be sure what the exact formula is for first page placement, we can say with some certainty the tactics search engines will favor. The more popular the site, the better ranking with search engines. Google states that we should “create unique, relevant content that can quickly gain popularity in the Internet community.” Google rewards websites that offer timely, relevant content. It also rewards links from one site to another with higher search rankings. This is where JC Penney got into hot water. The JCPenney SEO team created numerous links from pages containing non-relevant content to boost their search rankings. It worked for several months, and then Google noticed and their rankings went tumbling. The Web is basically a popularity contest. The more links coming back to a site, the more popular the site will be. It’s totally appropriate for a clothing company to have links from other apparel related sites. If the links come from completely unrelated industries, Google recognizes this and questions linking motives and may flag them as black-hat tactics. Black-hat tactics offer short-lived gains. You constantly have to re-formulate your strategy to out-smart the search engine and stay one step ahead of their algorithms. 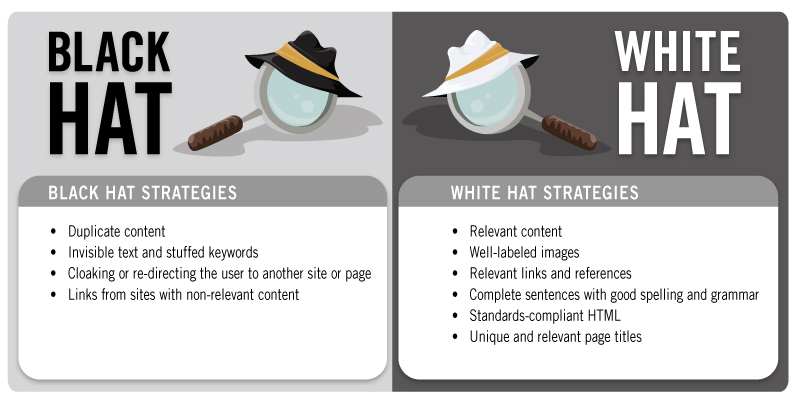 The consequences of black-hat tactics can tarnish your company’s reputation, not to mention bury your site in the organic search results. That can be a killer to a business that relies on website traffic. White-hat tactics produce long-term results. They require methodically working toward a goal through relevant links, and content and accepted practices by the search engines. It is slow and steady work that takes a well-planned strategy. There are no shortcuts. How do you ensure an internet marketing consultant is conforming to ethical online practices? Have they linked your site to websites with non-relevant content? Did they promise top position search listing without changing or adding anything to your website? Are your targeted keywords repeated over and over on your site to the point that the content doesn’t make sense to the reader? Do their promises sound too good to be true? Even the most reputable companies have been snagged by poor SEO practices. BMW and now JCPenney, among others, have found their search positions drastically altered or removed entirely from organic searches because of black-hat tactics. Educate yourself on the rules of search and make sure you understand the strategies being used on your website to reach your goals ethically. Easy come, easy go. Even in SEO. Nice post. Anyone looking to evolve their site or blog presence and seo rankings should know it all starts with good web development. Great post. Now a days people using some unethical processes to get #1 rank. But Google has a checkmate to stop all unnatural things. Google has powerful algorithm. To get top in Google index, we have to post relevant and high quality content regularly, build healthy and high weighted backlinks.